On your request via email, we will send you log in details, which will be comprised of your email and temporary password. Your email will not be shared with anybody. Your account will be associated with your Restart group. On your first login, you are encouraged to add an avatar (square images please) and correct information to your account. Simply go to the drop-down menu on the top right. Please change your password. 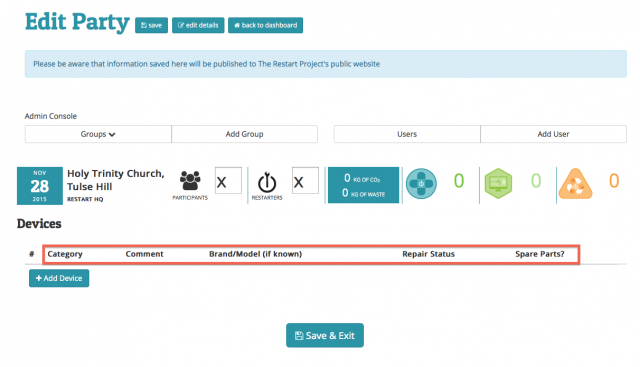 Note your name and avatar will be shared on a public page on The Restart Project website, so you can choose a nickname or image that preserves your privacy. Your group will appear on the left hand side at the top of the main screen. 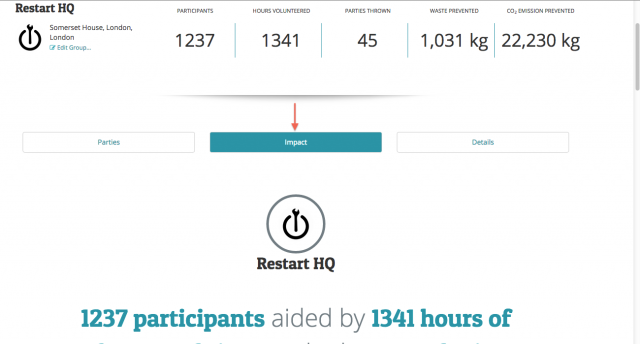 To edit your group’s details – which will be displayed on The Restart Project website – just click on the “Edit group” button. You can format text and add links to the “Description” field. On the first page after login, you will see “Upcoming Parties” under the brief data summary. Press “add new party” button to submit information on upcoming events. This will be published on The Restart Project website, and will help promote your event. Our house style is to use the name of the city/town/village/hamlet for the event name (e.g. Andover) or, if in a larger city, to use a specific neighbourhood or venue (e.g. Tooting instead of London), without using the term “restart party” or other variant. This data is likely collected on your public waiting list at Restart Parties. After your Restart Party has occurred, you will be encouraged to log in again to add data from your event. The process is quite simple – we describe it in the next section. On the main page you see when you log in, you will see a summary of your group’s impact. Below, if you click on “impact”, you will find some data visualisations that bring the data to life. Our data visualisation equates your climate impact with activities that we can relate to at an individual level, like household activities and consumables. Does “fixed” include devices which were improved? We include work-arounds and solutions that satisfy device owners. For example, if a device owner came with a “slow” laptop, and seems satisfied that the problem is solved, or that they have a coping strategy, we include this as “fixed”. There is a fair degree of subjectivity here. Our main interest is in knowing whether we have prevented the purchase of another device, that is, will this device still be used? How do I choose between “repairable” and “end of lifecycle”? “End of lifecycle” is for devices that owners have given up on. When a participant tells you they have given up, and are going to recycle a device, please designate this “end of lifecycle”. Often this happens when there is no insight into what is causing the fault, or when spare parts or professional repairs are too costly. Or simply when people have tired of trying to fix it. If on the other hand, an owner of an unrepaired device tells you they will try to fix it at home, come back to another Restart Party, get help from a friend or a professional, then we call it “repairable”. You’ll notice we also ask what is the most likely follow-up. The Spare Parts box indicates whether a spare part (or parts) would be needed to complete the repair successfully. Ticking this box does not indicate that the needed part(s) were available at the party, only that there is a need for an additional part(s). Please be sure to indicate in the comments field what part is needed (if known) and whether it is available at the party. What if a device does not fit in any of the categories? Please consult the key below to make sure you understand our categories. If a device does not fit in any of the categories, you have the option of choosing “miscellaneous” at the end of the drop-down menu. 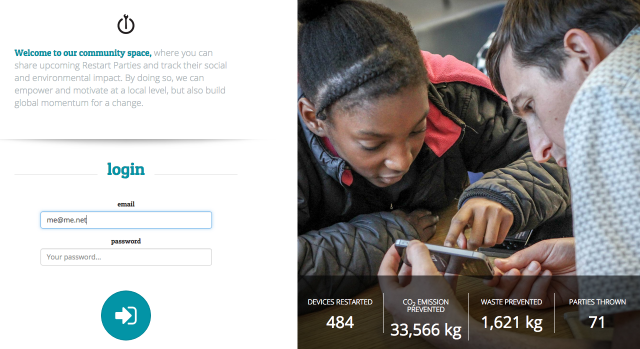 You will then be encouraged to estimate the weight of the device. Please use this option only as a last resort. What should I enter into the “comment” field? We use the comment field to enter information about the device, especially if it is rare or vintage. Mostly we use it to share information about the fault, and insight into the fix. This free text can be mined in future for valuable insights. Please share as much as you can. How often should I save the data as I enter it? Please note that our system DOES NOT have an autosave function. Data is only saved once you press the “save” button. Please press the “save” button every couple of devices entered, especially if you have poor connectivity to the internet. Can I enter data for historic events? Absolutely, in fact we encourage you to do so. Simply “add new party”, enter key information about the event, then when you return to the main screen, click on “add information” to add the data. Where can the public view our data? Group and event data is published on our public website. You can access data about all of your group’s events selecting your group in the events page. In the meantime, feel free to take a screenshot, copy/paste data, or download all Restart Party data in bulk. How can I publish my group’s data elsewhere? Please email us at [email protected] and we will issue you a new temporary password. How do I report a bug or get tech help? You can write to [email protected]. Please read this page, and search for help here first!